It is easy to be beguiled by the notion of outdoor bred pigs; easier still when you're down on the farm and compare the site of sows happily wallowing in mud or piglets freely running around in grassy pens with mum to the kind of intensive conditions the vast majority (approximately 75 per cent) of pigs are bred and reared in. So Safeway's decision to sell only 'outdoor bred' fresh pork under its own brand has to be a welcome move. There is no doubt the term 'outdoor bred' sends out all the right messages to consumers concerned about animal welfare, but when it comes to pig production, all that glitters is not necessarily gold. The pig industry in general has been badly hit in recent years, primarily by new animal welfare legislation. The UK ban on tethers and close confinement stalls from January 1999 has meant welfare standards here are higher than required in the rest of Europe (although the EU Commission has now proposed banning stalls and tethers but not until 2013 and 2007 respectively), while controls put in place as a result of BSE and Foot and Mouth, the strength of sterling, along with the prevalence of PMWS and PDNS, two wasting diseases affecting pig welfare nationally, have added to the pressure. According to Chris Lukehurst, Pigmeat Marketing Manager at the Meat and Livestock Commission, the result has been a dramatic drop in the UK pig breeding herd, the lowest level of production for more than two decades and down by a third in value between 1997 and 2001. Max Tooley, Fresh Meat Product Manager at Safeway, is adamant that a growing awareness of animal welfare issues among consumers has greatly contributed to Safeway's decision to convert all its Own Brand fresh pork to outdoor bred supplies from November 2001. 'When it was clear that outdoor bred, first used on Safeway's premium range was popular, and that it would be possible to procure enough pigs to convert to 100 per cent outdoor bred, the commercial potential became sufficiently attractive, and at the same time it would create a point of difference from that of principal competitors'. Tooley says the transition has not been easy. 'The challenge hinged around attaining a critical mass of farmers to supply our needs and at the same time convince them it was commercially viable. In addition, it is our responsibility as retailers to establish transparency and full produce traceability, ensuring product is fully segregated and identificable through the entire supply chain'. Grampian Country Pork Malton, one of the UK's largest meat processors, supplies the majority of Safeway's UK pork, including bacon, sausages etc. Grampian buy either directly from farmers or, more commonly, through marketing groups on a regional or national basis, sourcing pigs (whether indoor or outdoor reared) from farmers who meet Assured British Pig standards. When first introduced, 'Safeway's 'outdoor bred' pork commanded a premium price, but Tooley says that by working with farmers and processors they have now secured sufficient volumes to meet requirements, and remain price competitive. One of the holdings which supplies Safeway is based near Budleigh Salterton in Devon. A typical outdoor sow herd would be around 400 but there are 1,000 outdoors sows in this 1000 acre unit, making it one of the largest outdoor holdings nationally. Gilts (unserved sows) are bought in from breeding companies once they weigh in at 100 kilos at the age of around six months old and the production cycle ensures that around 150 sows in groups of 12 or 15 are farrowed every three weeks, producing 10 or 11 per litter - 1500 piglets - and producing on average 2.5 litters a year - a massive operation demanding high levels of stockmanship, and of course, land. Once the gilts have been served - in indoor pens by Artificial Insemination - they live outdoors in small groups in mobile arcs with access to mud wallows, essential in the summer to help the sows keep cool. A week before they are due to farrow they are transferred to individual outdoor grassy paddocks with insulated arcs with abundant straw bedding. The whole operation falls within the farm's rotational system. Piglets are weaned at 24 days at which point the sows go back into the shed and the cycle starts again - the sows are re-served, stay indoors for four weeks before going back into the fields and so on. When a sow has had 6 to 8 litters, at around four to five years old, it is sold, slaughtered and exported, generally to Germany where the meat is highly prized for dry curing. Only around 25 - 30 per cent of piglets are born in this kind of outdoor system - consumers may not realise, however, that the piglets only stay outside for less than four weeks before they are weaned and transported to a 'nursery' unit and/or 'finishing' unit. Safeway specification ensure the piglets, now termed 'growers', are housed in semi-intensive conditions in large covered yards or pens with straw bedding. According to Geoff Barker, Technical Adviser at Grampian, however, approximately 50% of 'outdoor bred' piglets are transferred to intensive units. Piglets are finished (slaughtered) at about 22 weeks, when they weigh in at around 95 kilos - and it is the meat from these now hefty pigs that carry the 'outdoor bred' label. 'Outdoor reared' would mean the piglets are kept with full access to the outdoors up to about 10 weeks before being brought in, again for indoor finishing. 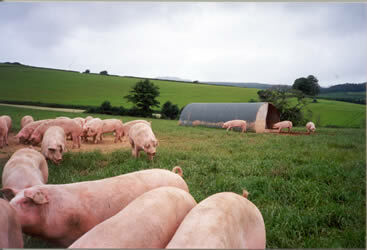 Outdoor reared pigs on any commercial scale are relatively rare, although a small percentage of Safeway's pork is outdoor reared, while commercial outdoor finishing units are virtually unheard of. But if only around 25 - 30 per cent of the pork we consume is outdoor reared, what's life like for the rest? Around 70 - 75 per cent of pigs are produced on intensive units. Although stalls and tethers were banned in the UK from 1 January 1999, both UK and EU legislation allows the use of close-confinement farrowing crates, prevalent in intensive systems - those in favour of this system argue that it is needed to protect piglets from being accidentally crushed by their mother; critics of farrowing crates say they are cruel because it effectively means the sow is confined for 28 - 33 days at a time while she delivers and feeds her piglets, plus it is often difficult for the sow to stand up or lie down and impossible to turn around. DEFRA is funding research to develop and test alternatives. Intensive housing often means large, dimly lit  sheds with no access to the outdoors. Bare concrete or slatted floors are generally preferred on the basis that they are cleaner and the high stocking densities help the pigs keep warm, although justification of intensive conditions invariably has a strictly commercial rationale - if pigs use energy to try to maintain body temperature, it can slow their rate of growth. But outdoor methods of production are not automatically better from a welfare point of view, as the Farm Animal Welfare Council (FAWC) have pointed out. There are several issues which raise concern, for example ensuring sufficient intake of food and management of temperature - keeping the pigs sufficiently cool in summer and warm in winter - all of which require a high standard of stockmanship. Safeway is already looking at further changes in its product range with animal welfare a key factor. Kelly Hathway, Category Buyer at Safeway explains: 'Our responsibility as a retailer is to develop more products using this supply of high quality outdoor bred pig meat - the next step will be to increase the proportion of the carcass used - sausages for example, which is seen as a tremendous 'drive' category, and other added value products.' At the moment only about 30 to 40 per cent of the carcass goes to the retail trade - effectively making the rest of an outdoor bred pig costly. The next step is to move our 'Safeway Best' range to 'free- range'.' However, there is no legal definition of 'free-range' when it comes to pork so it would be a question of Safeway deciding on their own additional 'spec' to make it even more attractive from a welfare point of view than outdoor reared. 'But it has to be carefully managed,' says Kelly Hathway, ' and it has to be commercially viable - as a retailer and marketer we have to look at how we promote that concept to customers without implying that free range is better than outdoor bred. We have to strike a balance between what we know customers will buy and moving forward. Yes, we want to get customers and producers together to link the whole supply chain and to help customers understand more about where their food comes from - on the other hand customers don't necessarily want to be reminded that the animal they are eating was once alive.' At the same time, both Kelly Hathway and Max Tooley agree that where customers do become aware of animal welfare issues and make their views known to retailers, it can have a significant effect on policy. Chris Lukehurst of the MLC believes the outlook for pig meat consumption is generally positive, but production is expected to recover very slowly. Whether the pork we consume will come from welfare-friendly production systems will depend on how far the government revises the welfare code for pigs, whether farmers embrace those changes and can still make a living as a result, how far retailers like Safeway continue to see animal welfare as a key driver in product development and strategy and whether consumers are prepared to take on board the sometimes inconvenient and unpalatable fact that the meat they eat has come from living, breathing, sentient animals - and are genuinely prepared to pay for higher UK welfare standards they say they endorse. If retailers really do listen to what their customers tell them - and enough customers were prepared to ask difficult questions about animal welfare, or make different purchasing decisions - the quality of life for farm animals in the UK could be transformed. Legal requirements require that lighting is at least 50 lux during daylight hours - between 9am and 5pm. For comparison, the Health & Safety Executive recommend that a typical office should have ambient light at 200 lux and a minimum of 100 lux.